The age of the Candidates age limit should be between 18 to 25 years.Upper age limit is relaxable by 05 years in case of SC/ST candidates and 03 years in case of OBC candidates. Candidates should Have to pay 500/- for General and OBC (₹ 200/- for SC and ST). The fee can be made through Demand Draft (DD) in favour of SECRETARY, KENDRIYA HINDI SHIKSHAN MANDAL, AGRA. 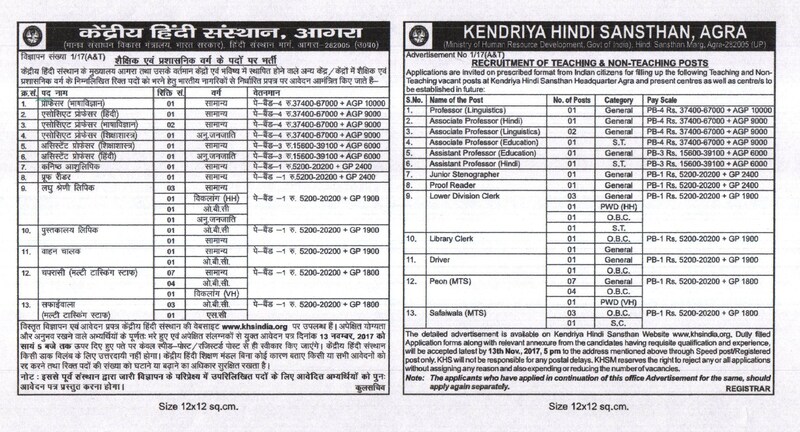 Interested and Eligible candidates may submit their application from along with bio-data, accompanied by a recent passport size photograph, self attested copies of testimonials and experience with Application Fee (DD) reach to Kendriya Hindi Sansthan (KHS) Address on or before 13/11/2017. Last date to Submit Online Application Form:13/11/2017. Candidates should Have to pay 500/- for General and OBC (₹ 200/- for SC and ST)For Non-Teaching Posts - ₹ 200/- for General and OBC (₹ 100/- for SC and ST). The fee can be made through Demand Draft (DD) in favour of SECRETARY, KENDRIYA HINDI SHIKSHAN MANDAL, AGRA. Interested and Eligible candidates may submit their application from along with bio-data, accompanied by a recent passport size photograph, self attested copies of testimonials and experience with Application Fee (DD) reach to Kendriya Hindi Sansthan (KHS) Address on or before 31-03-2016 by 5 PM. 0 Response to "KHS Agra Recruitment 2019 Teaching & Non Teaching 35 Vacancies"